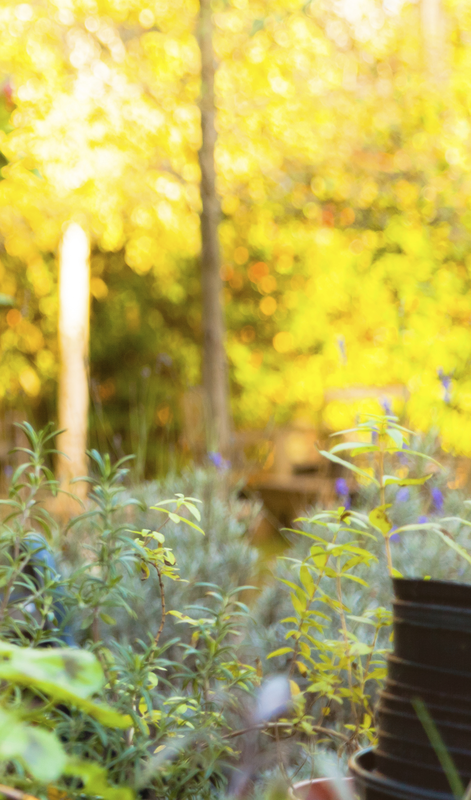 At BioFuel, we know our customers love the outdoors and everything about it! Whether you enjoy camping, hunting, fishing or hiking, all of these activities usually involve outdoor cooking. This is why BioFuel was created. We wanted to offer a safer and more cost effective solution to the traditional camping stove fuel cans that, until now, have been the only choice on the market. Biofuel is easy to pack and lightweight to carry, making it a perfect camping stove or warming fuel for the avid outdoorsman. 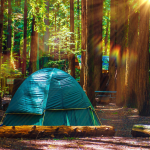 Check out our products and see why Biofuel is the perfect camping supply to add to your outdoor gear! Why Choose BioFuel for Your Camping or Outdoors Needs? There are four key features that makes BioFuel different than any other camping stove fuel can on the market! Our burner cans are reliable. With an unlimited shelf life, you won’t ever find yourself having to throw away “old” or unused BioFuel burner cans and refill fuel. Our burner cans are temperature adjustable. Where you’re cooking a quick s’more or a full outdoor meal, our burner can lids allow you to control the temperature of your BioFuel cooking fuel. Our cooking and warming fuel is safe, organic and non-toxic. We care about the environment as much as you do, so our cooking fuel is sourced from only all natural ingredients and our burner cans are spill / leak proof. Finally, our burner cans are refillable. No more lugging around extra bottles of camping fuel or stove canisters. All you need is a BioFuel burner can and a bottle of refill fuel and you’re ready to go! This reusable and refillable BioFuel can holds enough fuel to burn for 5-7 hours and can be used for cooking, warming or in emergencies. Save money by purchasing BioFuel fuel refills and top off your current stock of BioFuel burner cans. 15 ounce refill bottle. 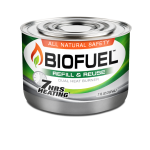 If you frequently use BioFuel burner cans, this 30 oz fuel refill can provide up to 30 more hours of burn time. 30 ounce refill bottle. This all-inclusive kit includes everything you would need to prepare and cook 1 weeks worth of food using BioFuel. 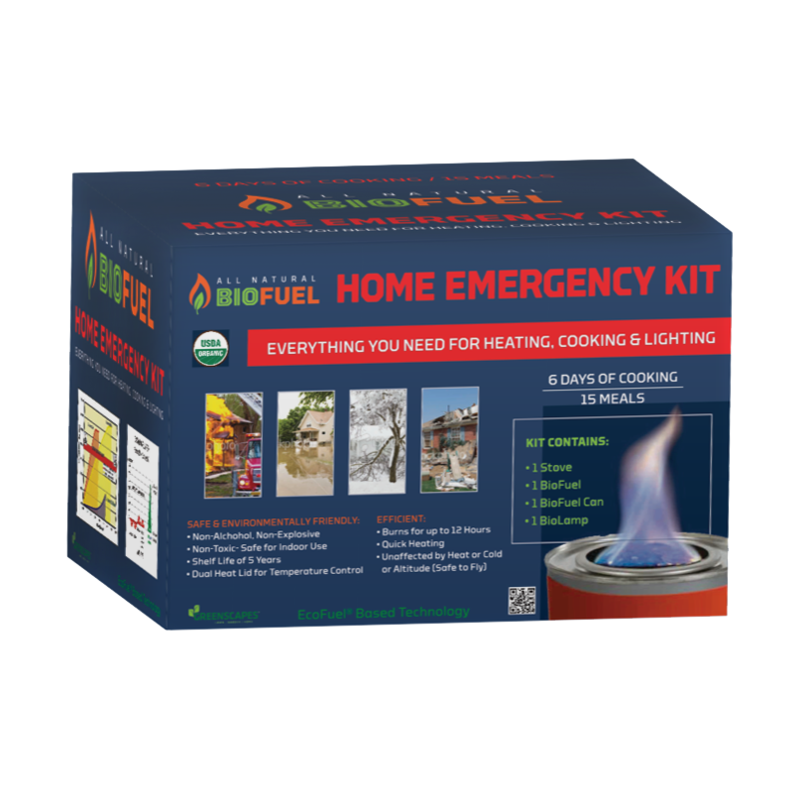 This all-inclusive kit includes everything you would need to prepare and cook 2 weeks worth of food using BioFuel. At Greenscapes, we are always here to assist our customers and to answer any questions that you might have about BioFuel or any of our other products. We also carry a wide assortment of landscaping fabrics, bird and wildlife netting and Black Flag bug zappers.